Electronic Edge: How to Make BSNL to BSNL Local Calls (on net) for 10 Paisa Per Minute ? How to Make BSNL to BSNL Local Calls (on net) for 10 Paisa Per Minute ? Do you own a BSNL mobile number and You have lots of people in your circle who use BSNL number too then BSNL to BSNL 10 paise per minute can be an attractive offer for you. With this offer, you can easily reduce your mobile bill by making phone calls at reasonable rate. To Activate this facility on your BSNL mobile number for 30 days, you are required to make a recharge of Rs 65 only. 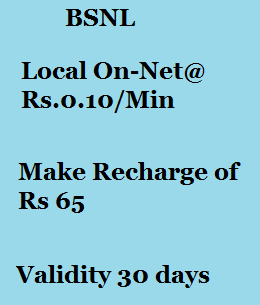 After this recharge, all BSNL to BSNL local calls will cost 10 paise/minute. This offer is available throughout India for all BSNL mobile numbers and you can make calls to all BSNL numbers in Local circle at reduced price.